A 1955 graduate of Notre Dame with a bachelor’s degree in electrical engineering, Bob McGrath founded McGrath RentCorp in 1979. McGrath RentCorp is a diversified business-to-business rental company with three primary rental divisions: relocatable modular buildings, electronic test equipment and liquid and solid containment tanks and boxes. The company serves a broad spectrum of industries, including construction, telecommunications, education, petrochemical and environmental. McGrath serves on the board of directors with Catholic Charities CYO of the Archdiocese of San Francisco. He is also active in the Knights of Malta and serves on the Institute for Church Life-Center for Social Concerns Advisory Council (ICL-CSC). Joan McGrath earned a bachelor’s degree in English literature from Marymount College and a master’s degree in theology from the University of San Francisco. She also completed doctoral coursework in theology at Fordham University. The former executive vice president of McGrath RentCorp, she also serves on the ICL-CSC Advisory Council, as well as the board of directors for National Catholic Reporter. She is a trustee for the University of San Francisco and is a former trustee for Graduate Theological Union. The McGraths have two children and three granddaughters and reside in San Francisco. 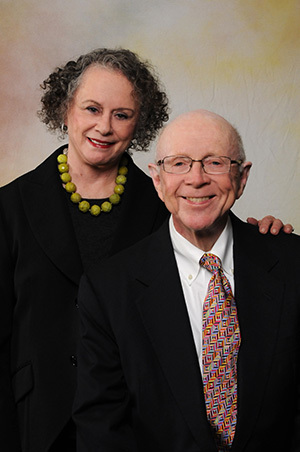 Among their previous gifts to Notre Dame is an endowment for the directorship of the ICL. The McGrath Institute for Church Life exists as an integral component of the University’s larger mission of teaching, research and service to society and to the Catholic Church. Through its resources, projects and affiliate centers, the institute reaches out to the whole spectrum of Church leaders — its bishops, clergy, religious and laity — to provide training and service as well as opportunities for spiritual rejuvenation and personal growth. In this work, the McGrath Institute for Church Life seeks to embody the spirit and mandate of the Second Vatican Council, to implement a mission of transforming the Church and society in light of the Gospel, and to renew the theological, ministerial, pastoral, catechetical and liturgical traditions of the Church. STEP/Camino — STEP and Camino provide theological education to pastoral ministers and other adult Catholics across the country via online courses in both English and Spanish. Notre Dame Vision — A program fostering the vocational imagination of high school students, young adults, campus, youth and liturgical ministers through theologically sound and creative programs. Echo — A two-year graduate service program preparing new leaders of faith formation who earn a master’s degree in theology while serving in Echo partner dioceses across the country as apprentice catechetical leaders in parishes and as theology teachers in Catholic high schools. Notre Dame Center for Liturgy — For more than 45 years, the NDCL has promoted the liturgical renewal of the Church through scholarship, pastoral education and spiritual formation for catechists, liturgical and music ministers, theologians, campus ministers at high schools and colleges, deacons, priests and bishops. Office of Human Dignity & Life Initiatives — Created by Father Jenkins, the office integrates principles of the Catholic teaching on the sanctity of life across all areas of the University and collaborates with relevant education and research programs across all colleges to support and enhance Notre Dame’s mission as a Catholic institution of higher education. Science and Religion Initiative — Created through grants from the John Templeton Foundation, this initiative works with high school teachers and administrators to address the often-perceived myth of conflict between science and religion with a combination of seminar programming, media development and the publication of educational material. The McGrath Institute for Church Life works in collaboration with the academic departments and schools of the University, especially the Department of Theology, staying conversant with the major currents of research on the Church and initiating appropriate new research to enable the responsible development of the Church’s intellectual and pastoral life. The institute provides leadership through its publications, training sessions, service to episcopal and national organizations, involvement in social concerns, research and educational programs. It also serves as a bridge between the University and the Church, linking programs and personnel on campus with Church leaders, University graduates and others who are concerned with the development of vital communities of faith. Originally published by Dennis Brown at news.nd.edu on September 23, 2016.